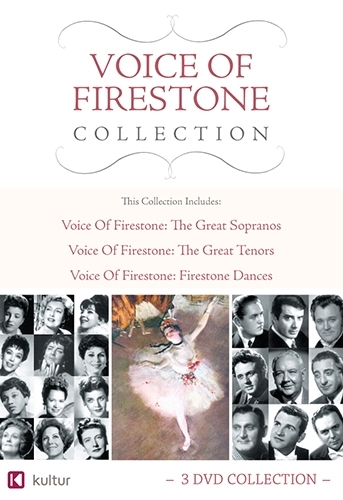 For more than thirty years, The Voice of Firestone brought the world’s greatest artists into the homes of music lovers. Now, through a special arrangement with the New England Conservatory in Boston, Kultur is proud to make these rare telecasts available. Among the treasures from the Firestone archives in Firestone Dances: Ballet Highlights are Rudolf Nureyev’s American television solo debut; the legendary team of Jacques D’Amboise and Melissa Hayden; the brilliant Maria Tallchief; Carla Fracci in a rare Pas de quatre set to the music of Pugni; as well as principal dancers of the Royal Danish Ballet and a performance by the Ballet Espanol Ximenes-Vargas. The Great Sopranos is a thrilling collection of important archival performances by the most important singers of the twentieth century, including Eleanor Steber, Joan Sutherland, Leontyne Price, Birgit Nilsson, Anna Moffo, Bidu Sayao, Renata Tebaldi, Licia Albanese, Helen Traubel, Roberta Peters, Patrice Munsel and Jeanette MacDonald. The Great Tenors features classic tenor performances from 1950­1963 with Jussi Bjoerling, Ferruccio Tagliavini, Jan Peerce, Lauritz Melchior, Jess Thomas, Nicolai Gedda, Richard Tucker, James McCracken, and Franco Correlli.